The problem is debt and currencies, he said, so it is no good for Christine Lagarde to utter shrill warning calls on the global economy facing a repeat of the 1930s and desperately needing a quick growth boost. First we have to clean up government finances and stop the world's moneys melting down causing an inevitable firestorm of inflation. Rogers didn't add that the next stage on from that firestorm is just as programmed: deflation shock and heavy contraction of everything, including debts. His claim that hard asset real resource commodities can weather the storm is time dated: not when deflation hits. How did oil, copper or wheat prices move in 2008-2009 ? According to Jim, the OECD debt crisis is out of sight today, relative to what it was in 2007 and it is hard to disagree with him. The economic crash should be proportional. Neither Jim Rogers nor any other guru will give us a scenario where the coal-fired Asian Locomotive runs out of steam even faster than the oil-starved Western Roadster. The conventional analysis, among Doomsters like everybody else, is that Asia will suffer less than the OECD countries when the funny time playacting stops, and sales of Donald Duck flashlights at any low price are even worse than Greek debt bonds at any high rate of interest. To be sure, Jim Rogers admitted that China and India already have inflation. He did not say the ways they are trying to solve inflation without killing their growth machines are exactly like the ways which OECD countries have tried, and failed, from as far back as the mid 1970s. Asian economies are slowing down and the rate of fall, measured any way you want, is much faster in real terms than the spreading slump in OECD countries. For China and India, the money gauges used to report and analyse their declining growth are much further distorted by "underlying inflation" than the OECD case, where this problem is already massive. The Asian slowdown is undercounted with the wrong metrics, and moving much faster than guru analysts like to say. Pretending the Asian slowdown isnt as bad as it really is first needs us to believe the Chinese real estate bubble is not collapsing. How fast this can happen and how much damage it will do has a real world test bench, well analyzed with all the details: Spain. The latest government data from 70 Chinese cities shows the average price of property has fallen at double-digit annual rates for the second straight month. For Rogers however, only parts of the Chinese real estate market have popped, and he says this only concerns a part of the country - urban coastal real estate - in a country where 80% of the people live at less than 80 kilometres from the coast, and the Hong Kong bubble economy is 100% coastal ! For various reasons India's real estate bubble is downplayed, but its implosion menace is at least equal to China's. Indian real estate business is a cesspool of corruption that stretches to the highest levels of government. Public housing is perhaps the worst, most threatening bubble in the subcontinent's bubble economy - driven by India's massive population and high population density, and feeding a huge web of chief ministers, army and airforce generals, high level bureaucrats, land holders and the overheated financial sector. One result is especially sombre: industry fundamentals are unknown because valuations have no real meaning anymore. The second result is totally predictable: Indian real estate investment is now the most difficult investing task on the stock markets and even hardened fund managers are now bailing out because the risk of almost unlimited losses is too high. How far down the bubble goes is anybody's guess, but 90% is a figure many Indian analysts throw around. This underlines the stealth mode collapse occurring in China and India. The data used for finding out what is happening has lost its focus. Not only speculators and players, but hardened market operators are staying away from the sector due to lack of trust. Claims by Jim Rogers, talking up his New Asian Home, that Chinese real estate financing methods avoid the extremes which gave us the subprime crisis are hopeful and highly charitable but are unreal. Before 2007, his storyline is that Americans and Spaniards were buying four or five houses with no job, no down-payment, and 120% loans (with the 20% extra to buy Donald Duck furniture and washing machines from China). The myth goes that China and India dont have that problem - but in fact what they have is far worse. The loans to finance phantom housing projects are lent to nobody, or rather persons who might or could buy in 5 to 10 years, represented "in trust" by often fictive or notional municipalities that either do not exist or will never be created. Housing and apartment types and fixtures/fittings are deliberately given upmarket specifications and costs, making it even more unlikely that real human beings can or could buy them. Exactly like the USA or Spain, Asian banks take the mortgage amounts and jiggle them up even more, play the cash on the pinwheel casino of the global finance machine, go bankrupt, and get bailed out by the State. We can ask: How is this different from the US subprime crisis or Spain's real estate meltdown ? Maybe only in one respect: related to their economies and average GNP per capita, the Chinese and Indian real estate bubbles are several times bigger than in the US, UK, Spain, Portugal, Ireland and other hard-hit countries now either openly in recession or near it. Strong industrial production growth and growth of exports from China and India can only absorb this hole in their domestic economies for a certain amount of time. With sales to the depressed European and US markets - their biggest export markets - already declining, the multiplier feedback of decline inside their economies will rapidly grow, This feedback inside their economies to falling demand growth is already producing the fast feedback of their central banks printing a lot more money: the inflation generating process is well under way, even harder to control than in the OECD economies which were already semi-stagnant or "in persistent slow growth" when the crisis hit, and is unlikely to stop anytime before the economy slumps. Our concern is to predict when decline shifts to sudden and rapid falls in overall economic activity. The OECD real estate bubble meltdowns provided the punch needed to tilt the whole economy into recession, due to the rest of the economy not being "competitive": this is a favoured pat-answer to why the overall economy fell in, so fast, and another claimed reason the current and ongoing real estate collapse in China and India will not "hurt" their economies so much. For Spain, before the real estate crash moved into high gear in 2008-2009, its trade deficit had hit as much as 10% of GNP. Any claims that Spain's trade deficit was "possibly linked" with the post-2000 real estate bubble has to face facts: national trade deficits have grown since the 1960s at an annual rate of about 15%, went higher in the 1970s and only declined during recessions such as the early 1980s, late 1990s and since 2007. Today, Spain's trade deficit stays high, proving that a real estate boom and trade imbalances are in no way necessarily related. Restoring the property and construction sector, or preventing future bubbles, have almost no relation to the subject of economic competitivity. Especially for China we have a trade imbalance the other way around - massive surplus, meaning China can print as much money as it wants to try stopping the real estate bubble from imploding, which in fact is exactly the same mechanism used in the trade deficit countries today. For India we have a trade deficit context comparable with Spain and its bubble implosion process. The same applies: India's trade deficit is nothing to do with the real estate meltdown, nor the way it spills out to the "real economy" and drags down economic growth. Through 2008-2009 Spain decelerated so fast that government publications had to cut the official forecasts for economic growth, and then raise the forecasts of economic contraction, almost on a monthly basis. Due to Spain (like France and a very few other European countries, and the US) having a trend rate of population growth of around 0.8% a year, when the rate of economic growth hit 0.8% in 2008, actual and real growth was already zero. Forecasts for the Spanish economy now range to declines of about 2.5% in 2012, but ignore the missing 0.8%. In Spain's real estate sector, leading the downturn, the negative numbers are impressive: to end November 2011 commercial property sales in Spain were 52% less than last year, house sales 38% down, and housing building starts falling 24% compared with year 2010 – itself considered a disaster. After helping trigger the decline of the general or overall economy, the real estate bubble kept on imploding, at least as fast as previously. Start-to-finish falls in nominal values can easily top 90%. This fast-feedback process especially applies to India with very intense growth-sapping implications shown by the simple, and simply massive numbers for needed employment growth in India to handle the working population's growth of about 12 - 15 million persons per year. Simply due to the additional "population bomb" factor, India's economic growth will fall to zero even faster than China. Beyond the "unthinkable" - zero growth in emerging China and India - we do not know if contraction could take hold but this possible after-crisis cannot be pushed aside. 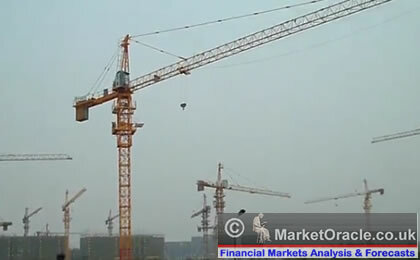 China has been building ten empty cities every year since the financial meltdown in 2008, just type a "Chinese ghost Cities" in Youtube and see for yourself, Greatest Depression on it's way, this is the cherry on the cake of the world's economic disaster. 1. The very concepts of Demand and Supply that drive all markets doesn't work that straight in Indian RE, esp in metros. Ideally, as order books shrink, prices are bound to come down. But hey, don't forget our fat layer of Black money that is always on the lookout for newer investment avenues, esp ones where piling cash can be easily stashed but can't be easily traced. And man, RE is the best bet for it, believe or not. 2. In the ongoing economic turmoil where all the assets are eroding in value including currency itself, where do you think people are going to put there money for safety - i could see two primary hard assets - GOLD and RE. 3. If housing has to correct, then INR has to dramatically increase. The reverse cannot be true (if INR falls AND housing corrects at the same time, then NRIs will rush in to buy RE, thus placing a solid floor on any correction). So under what circumstance do you think the RBI will let INR rise to meaningful levels? Note that all the 13 interest rate increases in the last year has not budged USD/INR which has already gone down to 53INR/USD from 45INR/USD till an year ago. India is doing exactly what China is doing: raising interest rates while printing tons of currency to keep the Yuan pegged to the collapsing USD. Asset price corrections are near impossible under such circumstances. Massive interest rate increases have done NOTHING to dent RE price levels in Delhi, Mumbai, Chennai, Shanghai, Beijing or Guanghou. Both China and India have housing bubbles because of their fiscal and monetary policies. Unless those policies change, people will continue flee to hard assets such as RE. 4. One of the reasons for high RE in India is that the average Indian investor does not have a lot of alternative asset classes to chose from where he can invest money because of the non-convertibility of INR. Indians cannot easily invest in (say) Mongolian equities or London RE because of these restrictions. If Indians have to sell Indian RE en masse (and that creates a correction), where else do you think they will park their money? In the fast-wilting INR? Sorry but Indians are not that stupid. Where you have a failing currency, real assets will always be priced highly in such places. House prices never meaningfully correct when measured in local currency terms in places with exploding populations and weak currencies. Don’t take my word for it. Just ask the people of Zimbabwe, Nigeria, Bangladesh, China, Pakistan, Angola, Vietnam when their RE prices last corrected WHEN MEASURED IN THEIR LOCAL CURRENCIES. You will get blank stares in response. 5. Gold prices reach a record high day after day after day. Indians have amassed massive reserves of Gold that they can rely on to fund any increase to EMI payments (even if interest rates reach stratospheric levels). There is much lower chance of the levels of mass foreclosures and defaults in India compared to US which triggered a housing collapse. Indians have substantial private savings in Gold unlike spendthrift Americans, British or Spaniards (sorry but its true). Don't forget India and Chinas are largest consumers of GOLD. 6. The Mortgage to GDP Ratio (ratio of outstanding home loans to GDP) in India is very insignificant in comparison to the other countries. Inthe developed countries the ratio varies from 25% to 60%. For the year 2001,themortgage to GDP ratio in India was at 2.5%. Whereas, total US mortgages were almost 50% of the GDP until about 1977 when the ratio started to gradually increase culminating in the year 2006, the height of the US housing bubble market when for the first time in history US mortgage debt outranked US GDP. I can keep going with more, but rest assured, Indian RE is in a bull-phase and continue to remain for next couple of years atleast. Current phase is just a stagnation in Indian RE. Apologies for unintentionally hurting someone's feelings.